Wedding Anniversary Shoot in New Orleans. 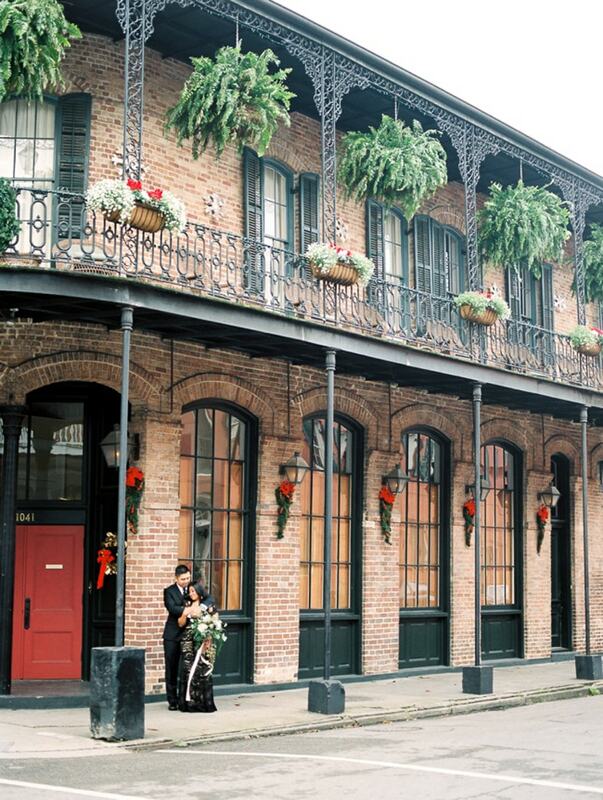 Some couples celebrate their 10th wedding anniversary with dinner or gifts, but for Samantha and Stephen, their milestone was celebrated with an anniversary photo shoot in New Orleans. This dynamic duo embraced the French quarter vibe, recounting memories in their favorite city as they strolled the quiet streets. The love story of these Houston natives began in high school and continued throughout college, even while attending separate institutions. But after graduation, Samantha moved home to Houston to be closer to Stephen and her family. After 10 years, they are still as in love as ever. Their photographer, who is also a dear friend, started the session by snapping photos of the couple’s wedding rings. And Samantha definitely didn’t forget the accessories. She wore a stunning pair of statement earrings to add glamour to her look. To capture the bridal bliss, Samantha commissioned a gorgeous bouquet for the shoot. Filled with dramatic amaranthus, ranunculus, greenery and more, she exhibited a romantic and chic vibe. Samantha wanted to coordinate her look with that of the French quarter. She accomplished this with a black lace gown and black pumps. And her flowing hair was undeniably beautiful hanging by her shoulders. Stephen complemented his wife’s style with a black suit, black tie, and small boutonniere. In front of one of the many colorful walls, these two stood out in their sophisticated black fashion. They strolled along the quarter streets, pausing every so often to offer an affectionate glance or share a moment. Their personal styles echoed the traditional style offered by the quarter’s architecture and ambiance. At one point, the wind picked up and there was a chance they could be rained out. Fortunately, these two were in New Orleans where carrying second line umbrellas are a popular wedding tradition. So, they grabbed some lovely parasols and made the best of it! They captured some of the best features of the city during their session: parks, culture, streetcars, and more. While every shot was focused on Samantha and Stephen, the touches of the city in the background were endearing. There was no better place to reflect and embrace a 10th wedding anniversary. While gifts or dinners are nice, their shelf lives pale in comparison to the sweet memories these two have for many more anniversaries to come.